I have two new gorgeous books sitting in our library book basket that I must share with you today. If you’ve been around this blog in the last month, you know we love picture books. We enjoy all kinds, but I like most the ones whose illustrations make me want to drink them in. The first lovely book is The Baker’s Dozen: A Saint Nicholas Tale, written by Aaron Shepherd and illustrated by Wendy Edelson. I’ve been trying to figure out how to approach the Santa Claus issue with my children as the Christmas season approaches. We want them to know that when we tell them something is truth, it really is. Baby Jesus is not a myth. But Santa Claus is. And so we are the parents who tell their children the truth but also tell them if they want to pretend Santa is real, that’s fine. Pretending is fun and it doesn’t bring so much confusion later on! One of the ways we can help them understand the Santa Claus legend is to tell them about the real man, Saint Nicholas. So while I was scanning the shelves for the story of Saint Nicholas, I came upon The Baker’s Dozen. What a beautiful book about giving beyond what we think we should or can give. The illustrations are richly colorful and expressive. I am still looking for the story about how Saint Nicholas began his tradition, but this one is great for teaching children that giving is the important thing at Christmas and in life. And did I mention it’s beautiful? 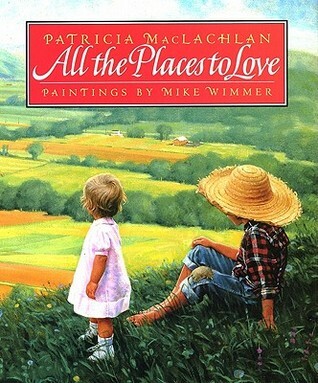 Secondly, I finally checked out the highly recommended All The Places to Love written by Patricia MacLachlan and illustrated by Mike Wimmer. I don’t know if my children liked this book as much as I did; it’s one of those “for the parents” picture books that gives you a lump in your throat for the country home you didn’t actually grow up in but still long for. Or maybe that’s just me. The love laced through the words and drawings in this book about a farming family is so tame yet so touching. I’m adding this book to the list of books whose pages I would like to live in. These books are my latest editions to the Mia The Reader Pinterest boards. I’m adding new stuff all the time. Check it out here. As always, chime in on your favorite beautifully illustrated books in the comments. Happy reading!